Vancouver Home Sales Rise 25% in September one year after foreign buyers tax. There was a 25 per cent increase in the number of homes sold in Vancouver last month from a year ago, when the provincial government slapped a new tax on mainly Chinese buyers in a bid to hold down runaway prices. There were 2821 homes sold in the metropolitan region of 2.5 million in September, up from 2253 sales a year ago, the Real Estate Board of Greater Vancouver said in a news release. Sales slipped 7.3 per cent from August when 3043 homes were sold. Up until recently, monthly sales had been declining in Canada’s hottest real estate market, where a sharp inflow of mainly Chinese offshore buyers helped push the price of a typical home to more than 12 times the median resident’s household income. 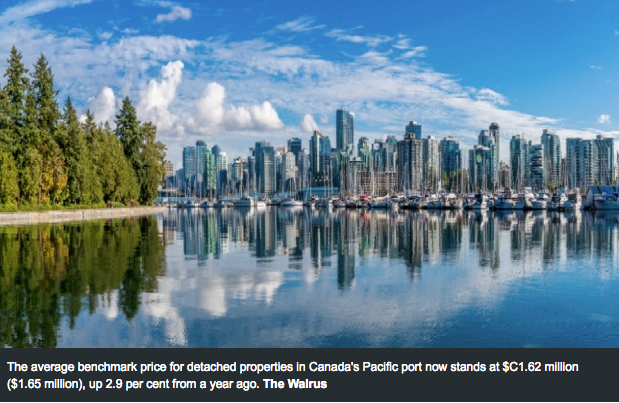 The average benchmark price for detached properties in Canada’s Pacific port now stands at $C1.62 million ($1.65 million), up 2.9 per cent from a year ago. Detached property prices edged up 0.1 per cent on the month. The average price for an apartment in Vancouver is now C$636,000, a 22 per cent increase from a year ago. September’s total residential sales were 13.1 per cent higher than the 10-year average sales figure for the month. The spike in sales stems mainly from a jump in apartment and townhome sales, while detached homes are holding steady, said Jill Oudil, president of the real estate board. “If you’re looking to enter the market, as either a buyer or seller, it’s important to understand these trends and use this information to set realistic expectations,” she said in a statement. 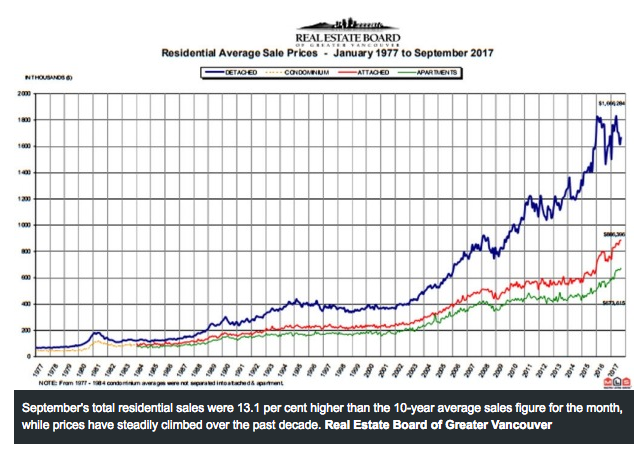 The average price of a home in Vancouver is now $C1.04 million ($1.06 million), an 11 per cent jump from September 2016 levels and up 0.7 per cent from the previous month, according to the board’s composite benchmark price index. Earlier this year, Vancouver topped a list of cities around the world that investment bank UBS identified as most at risk of a housing bubble. Sydney placed fourth after London and Stockholm. The government of British Columbia – Vancouver isn’t the provincial capital (Victoria) but the province’s biggest city – slapped a 15 per cent tax on offshore buyers in August 2016.